I have a male waterdragon who lives in my bush garden. I know he’s a male because he has a pink tummy and it’s great when he comes onto the deck to lie in the sun. But one day he was in danger. 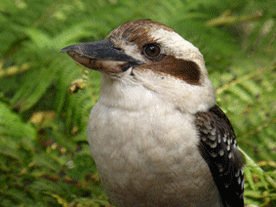 Two kookaburras sat on the railing and looked down at his wriggling long tail. 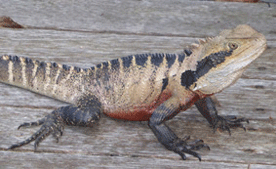 The waterdragon froze and didn’t move again until the kookaburras flew away. I’m so glad he is safe.